Crankshafts receive a thorough inspection upon arrival. A serial number is permanently etched onto the part. Crankshafts are then disassembled, cleaned, and Magnetic Particle inspected. If no cracks or metallurgical flaws are found, a detailed dimensional evaluation and visual inspection is performed. 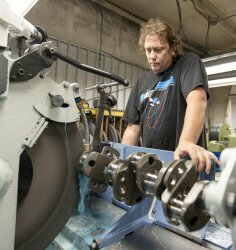 Crankshafts found within repair limits will be repaired on a custom shop order to your specification. 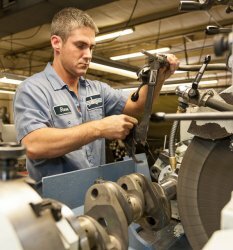 If bearing journals are reground the crankshaft must be renitrided to restore wear surface hardness and increase fatigue strength. 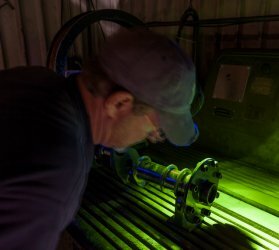 A second Magnetic Particle inspection is done and the propeller flange is cadmium plated for corrosion protection. Precision digital dynamic balancing is available which improves longevity and results in a smoother running engine. Counterweight assembly onto the crankshaft is available. An 8130 maintenance release is issued and the unit is custom foam packaged for shipping. Lycoming crankshaft customers - Aircraft Specialties is happy to announce we have finally found a reliable and predictable solution to restoring the dimensional requirements of Lycoming’s Service Bulletin 475C. We have partnered with an aerospace-quality plating supplier capable providing chrome that is precise and durable. This will result in a huge time saving and predictable delivery times. For customers wishing to avoid long processing times and want the ability to utilize any standard crankshaft drive gear – this is the best alternative. * Price includes STC authorization. STC paperwork separately is $225. Note: Price shown is with overhaul. IF stand-alone add $75. Balance with counterweights included, add $30.